This bread reminds me of snow globes, those glass balls with snow inside, that you turn upside-down and make them come alive. 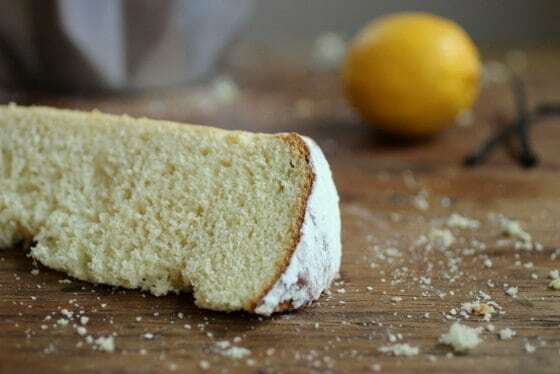 Pandoro is an italian sweet bread, with a flavor unlike any other. 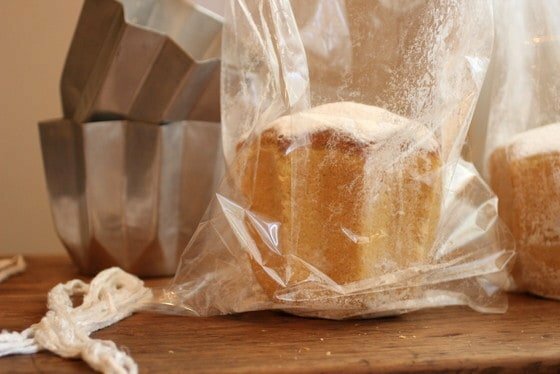 The bread is wrapped inside a clear bag, tied, and a packet of powdered sugar, usually vanilla flavored, is attached to it. 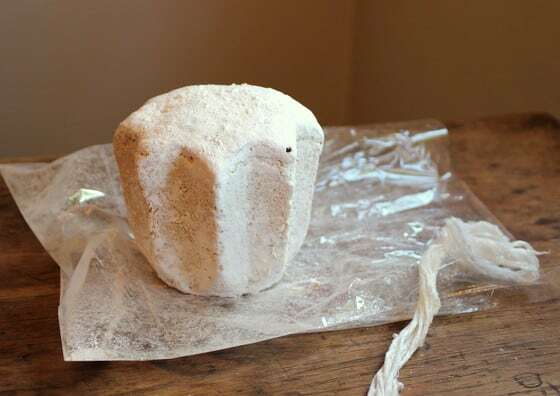 When you’re ready to eat it, you empty the packet inside, close the bag, give it a few shakes and out comes a white bread, completely covered in the sugar. It’s magical and festive. Let’s hope 2013 turns up that way too. Before you say anything, I know it’s upside down. The smaller part should be the top, but I serve it the other way around, because it usually doesn’t stand straight otherwise, and I don’t want a falling pandoro. This Pandoro bread is part of the Twelve Loaves baking group. The theme this month is a clean slate to start the year. Way too many options for a baking fanatic like myself, but then, I had wanted to make Pandoro in december, and since that obviously didn’t happen, this was the perfect occasion. Read below for details about this group. This is another egg and butter bread, like brioche or pulla. But the texture and flavor are completely different. Interesting how similar ingredients can deliver such different results. It’s a very simple sweet plain bread. 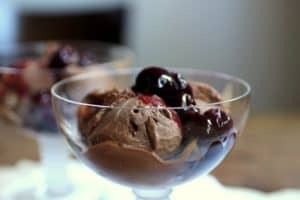 This recipe is the only one I ever made, and I don’t think I ever want to find another one. 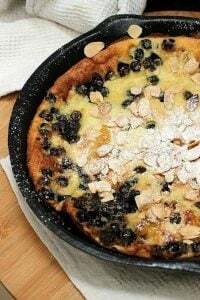 It consists of a yeast starter and two more steps until the dough is resting, but it gets done in less than a day, with a small amount of hand-on time, as it usually happens with yeast breads. A standing mixer is highly recommended; though it can be made by hand, well, it will be somewhat messy and you’ll end up hating me. And I want us to keep on being friends. As it usually happens, most yeast bread fanatics own a stand mixer, like myself, who got it as a wedding anniversary more than ten years ago. Seeing how my (ex) husband was very into giving me jewelry for important occasions, I had a serious talk with him and made sure he understood that, for me, things like a kitchen aid were far more life altering than any ring. 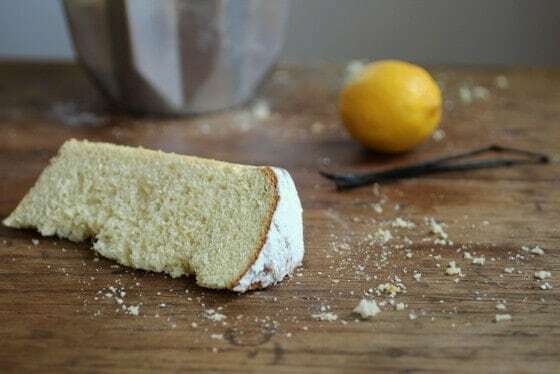 Back to this sweet bread, you can add some chopped candied lemon, but I think the beauty of it resides in it’s clean, unassuming appearance, and the extraordinary flavor that you discover when you take a bite. 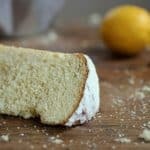 The crumb is tender, so tender it almost melts in your mouth. And the mix of vanilla extract and lemon zest, a small amount of each, gives it an undefined flavor. Like the flavor of these alfajores. The recipe use cake flour and bread flour together. This mix of flours works so well with these type of doughs I highly recommend you don’t change that. The first time I made this, was with cake flour only. I took the breads to a friend´s house on new year’s eve. They own a few bakeries, a family business started by my friend’s grandfather who was an Italian immigrant. His father was there, who has been a bread baker all his life, and he immediately said it was missing some texture. So the recipe was right about using both flours. In the bowl of the electric mixer, stir the yeast into the water and let stand 5 minutes, until foamy. Add egg, sugar and flour and mix with a wooden spoon until well combined. Let stand, covered with plastic wrap, until doubled, about 30 minutes. Mix the two flours together. Measure 2 ½ cups of this mix that will be used for the first dough, and reserve remaining for second dough. In a small bowl stir the water with the yeast and let rest 5 minutes, until foamy. Add yeast mixture, sugar, eggs and flour to the sponge. Mix with the paddle attachment until well combined. Add the soft butter and beat until well blended. Cover with plastic wrap and let rest until doubled, about 45 minutes. Add eggs, yolks, sugar, vanilla and lemon zest to the first dough and beat well with the paddle attachment. Gradually add the softened butter and mix until well incorporated. Add reserved flour and salt in ½ cup additions. Change to the dough hook and knead 8 to 10 minutes. The dough should be soft, buttery and delicate. It should not clean the sides of the bowl completely, but add up to ½ cup more flour if the dough is still too wet. Place the dough in a buttered bowl and cover tightly with plastic wrap. Let rest in a warm place until doubled in volume, anywhere between 2 to 4 hours. Sprinkle the top of the dough with the 4 Tbs flour. Turn out onto a well-floured surface and, with floured hands, cut the dough in half with a dough scraper or a knife. Shape each half into a loose ball and place in well buttered or sprayed star-shaped pandoro molds. Cover with a clean towel and let rise until doubled, between 2 ½ to 4 hours. Preheat oven 30 minutes before baking to 350º F /180ºC. Bake breads for 30 minutes. Reduce oven tº to 300ºF/150ºC and continue baking for another 30 minutes. If the top is too brown cover loosely with aluminum foil. Let cool on wire rack and unmold. 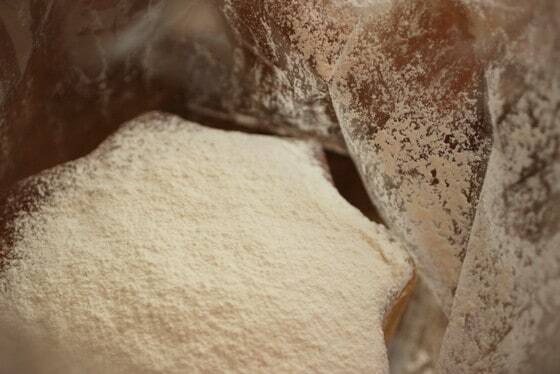 Dust with confectioners’ sugar and shake inside a cellophane bag before serving. This is a gorgeous bread, and you have inspired me to try it! Wow Paula! What a beautiful bread. And what fun to shake the powdered sugar on it in the bag. The shape is nice too. Now I'm going to have to add those pans to my kitchen wish list. What a phenomenal bread, and fun too! I've never heard of Pandoro so I feel like I learned something today. Right side up or upside down, it's a stunning loaf, Paula! Love your pans…such a wonderful shape!!! 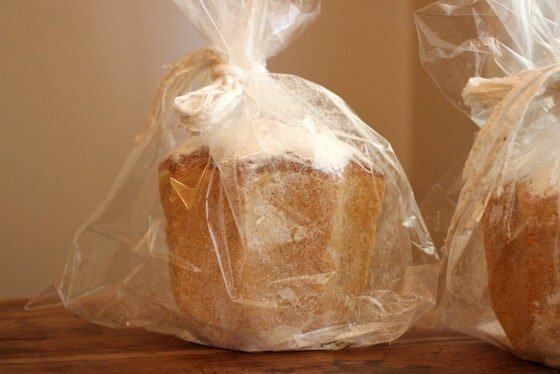 I love the idea of presenting this bread in a bag and shaking it with the powdered sugar– what fun! I will save your idea for Christmas gifts for friends and neighbors next year. Paula, this is simply gorgeous! I am definitely adding this to my to try list. 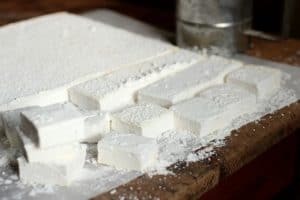 I love the end results with the bag and the powdered sugar and right about now I am wishing I lived closer so I could enjoy a slice with you. Happy New Year my sweet friend! This bread not only sounds delicious but it looks so dainty (is that a funny word to use to describe bread?) and beautiful. looks delicious and i love the shape – so beautiful! Paula, I simply LOVE the first paragraph and how you described this bread! Wow, it IS magical .. love that that is powdered sugar and in a bag! How wonderful is that? I must try this! Absolutely gorgeous…. I am so trying to make one just like it….hahaha I could never bake something this pretty! 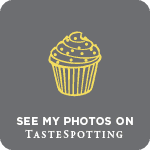 Beautiful – pandoro is on my wish list; I am going to have to give this one a try. Paula, your bread is beautiful, and you have two Pandoro pans? My kitchen equipment hoarding gene is jealous. Pandoro is totally on my wish list and I too meant to do it in December. Must try. Must try. I have a habit of buying in twos, always have. Many bread and cake recipes are for two, so they come in handy! Despite it's upside down, it looks really great. Wow! I never thought to make pandoro at home, I'm from Italy and I was used just to buy it… I didn't spend this winter at home so i missed it so much! 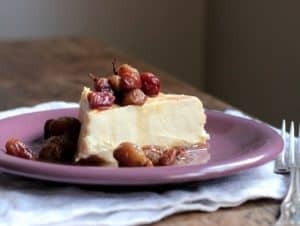 Did you also make the mascarpone cream to eat with? It looks amazing! Thanks for sharing this recipe! 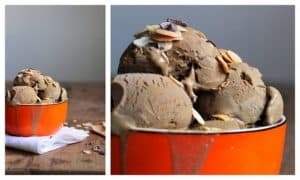 I will have to try this as it reminds me of panettone which I love. It is so fun to make simple breads and so cool how it is covered in powdered sugar. Totally agree that some bread doughs just need to be made with a stand mixer. Paula, happy new year. I am playing catch-up – you are certainly busy right now! the plum yoghurt cake looks pretty – our plums will be ready soon so you have inspired me. and the cheese and ham french toast looks decadent – just right for this time of the year. let's hope 2013 is full of deliciousness – you are off to a lovely start with this interesting italian bread. This bread looks so pretty and lovely for winter. I like the shape of it, too.